← What’s For Dinner March 18th at the Community Kitchen? Follow these guide lines when preparing food. Always use clean and sanitized work areas, cutting boards, knives, and utensils. Take out of storage only as much product as you can prepare at one time. Uncooked eggs that are out of the shell should be cooked promptly. You can store eggs out of the shell in the refrigerator at 41 degrees F or lower for no more than two hours. 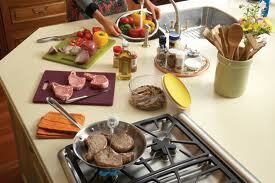 Make sure fruits and vegetables do not come into contact with surfaces that have been exposed to raw meat and poultry. Wash all fruits and vegetables thoroughly under running water before cutting or combining with other ingredients. This includes melons, oranges, etc. that you may be cutting through but not eating. Bacteria can be pushed into an unwashed fruit or vegetable when being cut with your knife. Store your canned tuna fish in the refrigerator so when you make your tuna salad it will be at 41 degree F or lower. Warm tuna will raise the temperature. Use cold eggs for egg salad. Use cold chicken for chicken salad. Use cold ham for ham salad. It will help keep your protein salads at the proper temperature. Handling food safely prior to cooking is very important. While cooking food to the required minimum internal temperature is the only way to kill micro-organisms it does not destroy spores or toxins that micro-organisms create. Safe handling of the food before it is cooked is essential to preventing micro-organisms from growing and producing spores and toxins. The minimum internal temperature at which micro-organisms are destroyed varies depending upon the food. Minimum internal cooking standards have been developed for most food and will be listed in our next article. Here’s to your healthy kitchen!